Today’s task: “Spring Cleaning”, choosing an ingredient/spice/condiment that’s been hanging out for a while and give it the love it deserves. My choice? The good old No Yolk wide egg noodles. Honestly, there’s only one thing I use these for and that’s a Noodle Kugel, or Noodle Pudding. It’s one of those tradition foods-and any Jewish person will have a preference between a sweet or a savory kugel and a preference between a crunchy topping and a non-crunchy topping. Me? I’m all about the sweet, non-crunchy topping. It’s just one of those dishes that makes you feel good….like when you get a hug from a long lost friend. It says “Hiya, friend. I haven’t seen you in a while. But, as you can see, I’m still the same.” Do you know what I mean when I say a hug from a long lost friend? These are called Food Memories. And they can run the gauntlet between very, very good and very, very not-so-good. Kugel is a very, very good memory. I rarely make it, but when I do, it’s always eaten and appreciated with a smile. 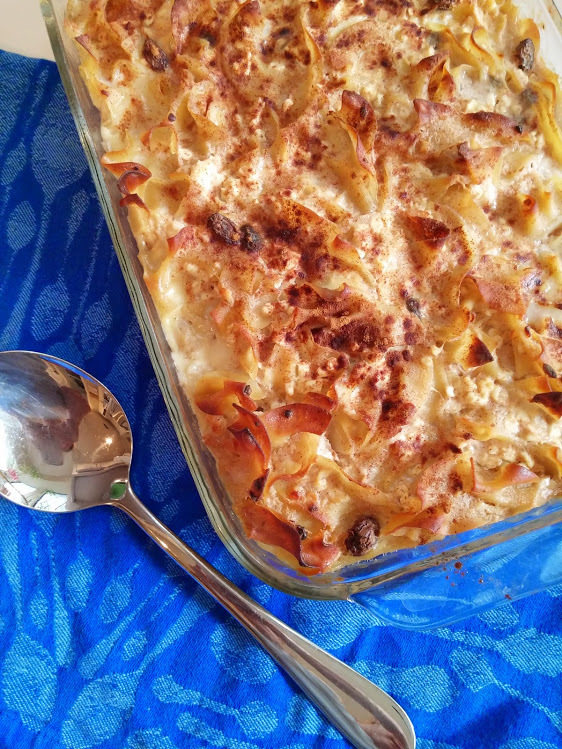 Love the history lesson on the noodle kugel (and your photo of the bag in the store – classic 🙂 I love me some kugel but it’s been years since I had it – I need to make it for my goyum self! Knew you would love the in-store photo. And of particular interest to me are the words that rhyme with kugel. So good to know for party fodder. i am always learning something new here..thanks for sharing this delicious pudding. I had never heard of noodle pudding, or kugel! I think I would like the non-crunchy sweet topping, as well. I am pinning this to make sometime! Thanks for sharing! Hi Brittany-people are very devout in their topping preferences!! 🙂 Hope you make it sometime–please stop back and let me know how it turned out when you do! I’m sure you guessed that I love noodle kugel and mine (which is really a makeover of my mom’s) looks pretty similar, except it doesn’t have dairy. I’ve been meaning to post it for a while. It actually bugs me that my husband calls it noodle pudding. It’s a KUGEL dammit!! I’ve actually never had kugel before which is a shame because it sounds delicious! Definitely putting this on my to make list! I have never heard of kugel but I have a feeling it’s going to make it on my table very soon. I’m not a sweet noodle person– what are some savory topping options? Megan, you’ll see most recipes with onions, garlic, shallots and/or a combo of these. You can also add greens to them or any veg, really–all to be mixed into the noodle mixture and not on top. For a topping, you can always do breadcrumbs. Let me know what you do! It’s been years since I’ve made or eaten kugel. I love it. I like the sweet type, with or without the crunchy topping. I worked for a pasta company back in the 80s and one of the recipes we came up with was a kugel. I’ll have to give your recipe a try. Sounds good.